Two "encounters" last week reminded me just how dang lazy we are as humans. And both involved short-cut left turns. Whether on foot or behind the wheel, we have no idea to execute this simple change-of-direction maneuver. I'm at Lifetime Fitness on 121 in Allen/McKinney. The entrance to the men's locker room is this wonky z-shaped back-and-forth hallway. The unwritten rule - as it is everywhere in our country - is "keep to the right." Right? Nope. Almost on a daily basis guys either entering or exiting don't stay to the right, but instead - in an attempt to shorten their path by two steps and shave, what, 3 seconds off their commute? - veer sharply to the left, their left shoulders literally scraping the left wall. I'd love to set up a video camera and record the physical contact and collisions. Countless times the guys correctly keeping to the right are interrupted - and often bumped into - by the lazy folks intruding on their personal space. Sometimes I stop in my tracks on the right side, only to have an ignorant short-cutter stare me down while saying "Excuse you." It's why we need rules. Lanes. - CLUE #4: "Romo's" - Signs. And, in this case, those fabric funnelers they use for airport security lines. To keep the crazies - and the lazies - in check. Same goes for you, Mr. White Truck Driver in McKinney last Saturday. I'm driving down a road that splits a couple of business parking lots. I have a stop sign, the white truck does not. But that doesn't, however, give him the right to make his left turn onto my road so sharp that I'm forced to hit my brakes to avoid contact, a good 20 feet short of my stop sign. To accentuate his ignorance, he gave me "the look," as though I was at fault. How about this: Stop fantasizing you're a NASCAR driver and start making proper left turns, swinging out wide enough to the right as to not impede or endanger your fellow man. Is that too much too ask? Whether on foot or in a truck, apparently it is indeed. *Driver goes on a spinning, hitting, drunken rampage before ramming into a Blockbuster in his ... White Truck. *Police looking for man who abandoned an injured dog out of his ... White Truck. 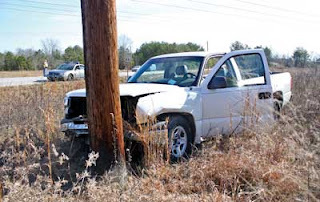 *Female drives across school yard and into a tree before leaving scene in her ... White Truck. *Old creep tries to lure 5-year-old girl into his ... White Truck. *Four men rob a Tiffany's by smashing through the front doors in a ... White Truck. Seriously, if you're going to keep going with this dipshit column every week, at least get a picture of yourself with a real white truck. The only people who think "truck" when they see a Honda Ridgeline are gay men, some (but not the majority) soccer moms, and whiny yuppie semi-straight men. Thanks for the feedback. I'll see what I can do.